There are tons of types of nutritious drinks for toddlers, so it may be hard for parents to figure out which ones are the healthy drinks and which are the ones your toddler can live without. Parents often find themselves choosing drinks that are convenient, rather than ones that are healthy. There could be many possibilities you see that are good for your child’s growing body, but that doesn’t mean they’re nutritious. Water is the best drink to possibly give your child. The sooner you start giving your child water, the more of a chance they will only consume water as they grow older. The best things about water is that it’s free, fat-free, calorie free, and additive-free. If your water is from the tap, it contains fluoride, which prevents cavities. If plain water is too boring for your tot, add fresh fruit to make it tastier. Having your tot drink milk in moderation is best. When a child drinks too much milk, they will fill their tummy up, causing them to be full faster. Milk is especially important because it contains calcium and vitamin D. Most children are deficient in vitamin D, but giving your child milk will help to add that important vitamin to their diet. Skip the added flavors, as they are unhealthy and not a good choice for toddlers. Juice is acceptable only to drink if the juice is 100% natural, it contains no artificial flavors, and if it’s not from concentrate. Making whole fruit juice at home is by far the best and most healthy option to give your child. If you choose to give your child juice during the day, cut it with half water so it’s not too sweet. 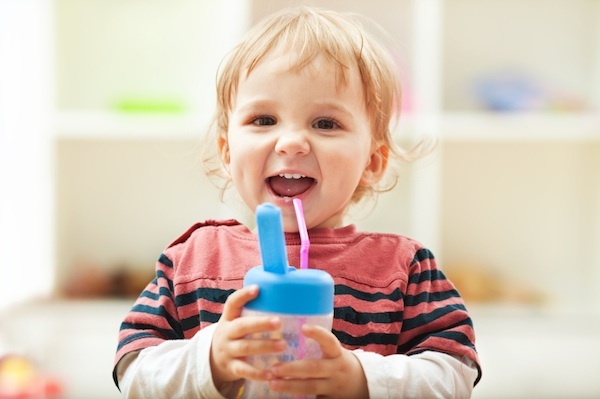 If a toddler gets used to drinks that are sweet, they’ll want them more in their diet. Giving your child vegetable juice is a great way to give them their vegetables for the day. You can try using different vegetable combinations to find the best tasting drink for your child. Instead of milk from cows, give your child the alternative of crushed almonds which is fortified with calcium and vitamins A, D, and B12. Regular tea (green or black) contains tons of antioxidants, but make sure you skip the caffeine. Remember, ginger tea is a wonderful way to cure sickness in kids. ← Did Cannabis Helps Autistic Child Speak?